NURMS output approximates a NURBS surface by defining vertices of a polygon lattice. Weighted vertices and edges for NURMS provides a true, clay-like modeling feel while interactively modeling the defining mesh. NURMS vertex weights can also be controlled from the base EditableMesh. Now to use this tool, we are going to make an eye. Begin with a simple Spline (in Red). Select it from the Sub-Object menu. Scale the Spline with the "shift" key in order to get the second Spline. 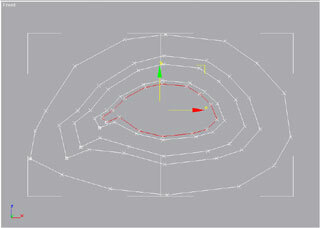 Repeat this process four times, and you will create five Splines (like the picture on the right). 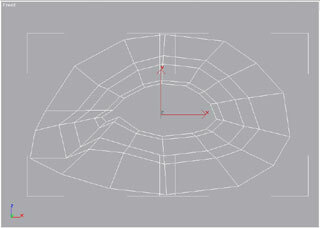 Go in the "Modify " panel and apply the "CrossSection" modifier. 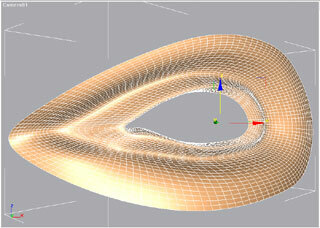 Add the "Surface" modifier in Patch Topology Steps 0. Bend the model 25 degrees. Go in the "Modify " panel and apply the "Edit Mesh" modifier. In the Vertex Sub-Object menu, select Vertex and move it up and down along the Edges. 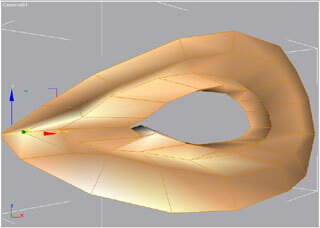 Now; to stop working in the low polygon mode, apply the "MeshSmooth" Modifier in the NURMS mode. If you want to modify your mesh, go down in the Sub-Object Stack, press "Show end result on/off toggle" and move the vertex with "Edit Mesh": it's great to use NURMS to make Morphed Targets. 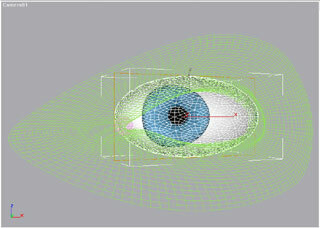 To make the Iris of the eye - scale and rotate a Geosphere and apply an Iris bitmap. 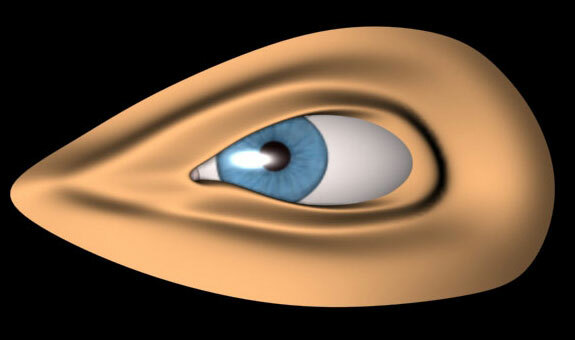 Add a second small Geosphere between the skin and Iris. To make a nice skin color material, use the Multi-Layer Rendering Shader to mix a hard specular and with a softer one. You can now see, the incredibly smoothed result of NURMS. 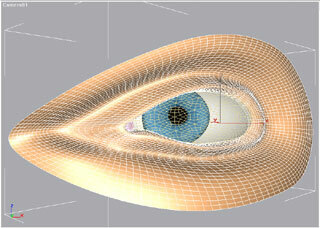 Now you can continue modeling the rest of the face using the same method.